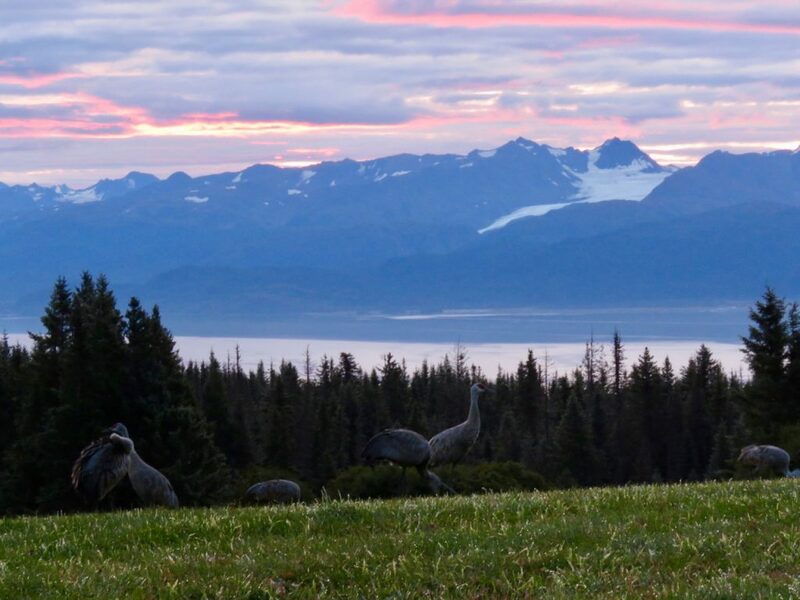 The 2018 summer Sandhill Crane nesting season in Homer, Alaska is winding down. It is September 21 and very few reports of cranes remaining in the area are coming in. At Inspiration Ridge Preserve, nine cranes showed up this morning at 7:30 a.m. including two families of one and two colts and two separate adults. This is getting late in the season but these were late nesting birds, so their colts need a bit of extra time to get strong enough for the migration to California. The Annual Report will give you a summary of the summer’s activities and some information in tables of arrival and departure times and nesting success. Feel free to share with others interested in Sandhill Cranes. As always, it is a bit sad to see them leave, but as the cycles of nature continue, we know we can look forward to their trumpeting heralds to bring us back into spring. This morning’s sunrise with nine lingering cranes. This entry was posted in Blog on September 21, 2018 by Nina Faust.